I have some miscellaneous items about medievalism and writing that I wanted to share today. "Even the patience of the brothers was being tested by our slow Internet." -- Father Daniel Van Santvoort, Cistercian monk, on his Welsh monastery's decision to get broadband access. The image of monks in my mind's eye is one of balding men wearing robes and diligently copying sacred texts with quills and parchment in candlelight or possibly tending gardens and making wine, all the while being subjected to periodic or extended vows of silence. I did not imagine them surfing the net, sending email or complaining about the slowness of dial-up internet connections. I guess even the habits of monks evolve over time. Gabriele Campbell has shared pictures of the Regenstein castle in Germany that shows a castle different from traditional stone fortresses because it is partially sculpted from the mountainside. She has two posts on that subject. Post one and Post two. 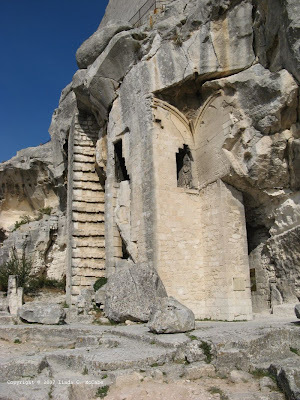 Her pictures of Regenstein castle remind me of the ruined fortress at Les Baux-de-Provence. 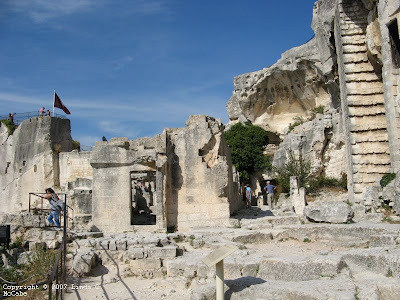 I have to continue with my travelogue posts, and my day at Les Baux will be the subject for a future post, but in the meantime here are a few pictures of that site to illustrate my point. You can see smooth portions of the mountain as well as bricks that are attached in order to achieve the shape of the fortress. Well, what is left of the fortress for it now stands in ruins. Below we can see why this location was chosen besides having the natural resources of rock. Namely it has a strategic vantage point. For those who are a part of the medieval blogosphere, you have probably already read Jeff Sypeck's analysis of the military conflict going on in Ossetia between the nations of Georgia and Russia. If you are one of my readers who is not a medievalist, I recommend you take a few minutes to read his post for it puts the current conflict into an historical perspective that spans more than a few centuries and actually goes back to the time of the Romans. On other news, I discovered the other day that my friend Erika Mailman's book The Witch's Trinity is due to be released in paperback on October 7th, just in time for Halloween. It is an historical novel that deals with the hysteria surrounding witch trials in Europe and uses the Malleus Maleficarum as inspiration of the various "tests" used to determine guilt or innocence of accused witches. Precursor to the broom where shapeshifters are in animal forms on a stick while flying through the air and trampling the cross where witchcraft is seen as a reversal of Christian traditions. And for some unknown reason, the reviews for her hardcover version no longer appear on Amazon.com. Human nature can be strange. The mentality of a mob for example, shows how brutal people can become when surrounded by others who are filled with passionate anger. Erika Mailman shows us through the eyes of an elderly woman what it would have been like to live in the Middle Ages when witchcraft was thought to be the cause of any misfortune. The famine described in this small village of Tierkinddorf, Germany is haunting. It made me feel strange reading the novel while having my lunch. I began to feel guilty knowing that the characters were willing to accuse others of witchcraft just to get a bite to eat. A scapegoat was needed to place all the blame of the village's misfortune. It was thought that then, all things would revert back to days of plenty. That the famine would end. The paranoia, the suspicion, the opportunity to point the finger of blame at someone whom you bear a grudge. An accusation of milk spoiling was enough to damn someone to being burned to death, and you didn't even have to bring forth the spoiled milk as evidence. Your word was enough, if coupled with other such scurrilous complaints, to condemn someone to death. Given today's sensibilities the thought of public execution is abhorrent. However, it is a gruesome part of our history that drawing and quarterings, beheadings, hangings, and burning at the stake were all done in the village square to serve as a lesson to all. Beware or it may happen to you. The Witch's Trinity is a potent tale whose ending surprised me. Speaking of friends and books...Lee Lofland, author of Police Procedure and Investigation: A Guide for Writers, alerted me to an interview this past week where he was a guest on National Public Radio's Talk of the Nation. The subject was about ethics in police interrogations and its genesis was due to the accusation that the intense and/or obsessive scrutiny by the F.B.I. in regards to the Anthrax murders led to the suicide of Dr. Bruce Ivins. Gus Van Zandt was also on that show and you can listen to that interview here. Closer to my home, Gil Mansergh reviews the movie Bottle Shock which is a Hollywoodized version of the events in Paris in 1976 when a California wine shocked the wine world when it beat the French wines in a competition. Gil then created a list of movies which includes mentions of wine. He even included the Muppet Movie's mention of a fine Idaho wine. Another item of local (and national) interest is Sonoma County's own Levi Leipheimer winning a bronze medal in the Summer Olympics in the Men's Cycling Time Trials. I was unhappy with the organizers of the Tour de France disqualifying the Astana team from participating in this year's tour. They were punishing Astana for the actions of former riders who were caught doping, but by not allowing that team to compete it penalized Levi and Alberto Contador who had just signed with the team and had never been linked to cheating. Sonoma County will be looking forward to having another grand celebration to welcome Levi home as we did in 2007 when he place third in the Tour de France. Santa Rosa loves cycling and it shows. We have been a part of the Amgen Tour of California since it started three years ago, and have had the largest crowds of any city in the tour. So we will once again be included in that race and will root for our Favorite Son Levi to win the stage and stand at the winner's podium. Life in the cosmic sense delivers good news and bad news sometimes close together. So while I am celebrating on behalf of Levi's success in life, I am also honoring the life of someone who passed away recently. 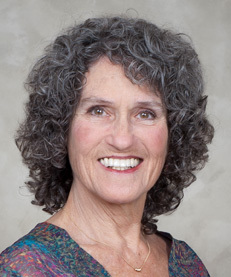 Joan Price is a writer in my community who was a guest speaker for my writers club and brought along her husband Robert to the meeting. He did not say much, but it was evident there was a strong love between them. Joan recently posted notice on her blog of Robert's death from cancer. They had seven years together as a couple. It was a love that she waited years for. She had other relationships, but none like the one she had with Robert. In her time of mourning, people are telling her that they envy her for having had such a powerful love relationship because they have never experienced such a thing. Her reply? It is never too late for love. She also posted in her comment trail how the gift of poetry can help in such a time of profound loss. I wish everyone the ability to love with their full heart and have that joy unconditionally returned by another. Even if the time with your beloved does not last for your entire life, the love will. That's another cool castle. Dang, I should save for a trip to France. And polish up my French. I'm glad you liked the pictures. 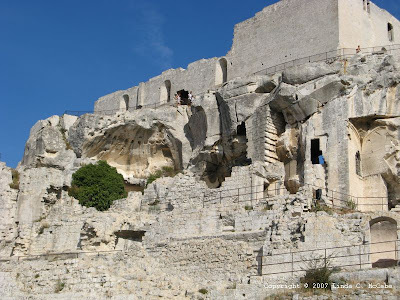 Les-Baux-de-Provence is a beautiful site, but the drawback from me was how much of a tourist trap it was. 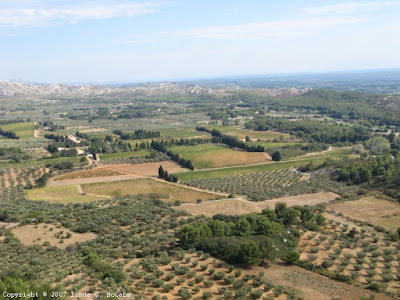 I had gone to so many amazing sites in the Midi-Pyrenees and then did not appreciate going to places swarming with tourists once I arrived in Provence. One sign that made me cringe was a lettered, "we take U.S. Dollars and travelers' checks" outside one of the merchant shops. In the Midi-Pyrenees, we were oddities being American tourists, but in Provence you couldn't swing a dead cat without hitting one. It had such a different feel to the area. Thanks for including my post in this terrific collection of links! I'm disappointed that TIME magazine didn't elaborate on the circumstances that required the monks to need broadband access. I've done a few quick searches, but I can't find any larger article, interview, or report from which they plucked that quote. And I admit, I'm intrigued. I was happy to include a link to your blog and essay. As for the Time magazine thing, it was on a page full of zinger quotes without really much context. I just tried doing a Google search to see if I could find anything of its greater origins, and wasn't successful. However, I did come across the website of the monastery. I found that on a website with links to many other online monasteries. That website has the wonderful base URL name of "surfer-monk.com." Things have certainly changed from the time of Saint Namphaise. Perhaps if you emailed Dom van Santvoort he might give you the greater context in which the quote appeared. Linda, I just read what you wrote about me and Robert, and I'm deeply moved -- thank you. Thanks also for the links so your readers can follow my story. You're welcome. I was moved as well by the posts on your blog about your love and loss. I wish you peace in this time of transition. Hopefully our physical paths will cross in the near future so that I can give you a real hug and not just a cyber one.